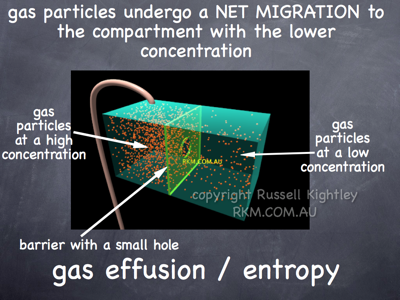 GAS EFFUSION: when a gas migrates to a vacuum. The animation shows two compartments separated by a barrier. The barrier has a small hole. Gas is introduced into the left compartment and the particles bounce around. Some particles will escape from the left compartment, through the hole, and into the right compartment. There will be a net flow from the left compartment to the right compartment until the concentration is the same in both compartments. In a similar case, two separate species are allowed to mix (see animation of diffusion). BUY THIS ANIMATION of effusion!